With ProComic: Hits users can now apply fully customizable comical hits to their footage all within Final Cut Pro X. Users can rotate each preset within 3D space and are even given a custom drop zone preset to design their own comical hit. 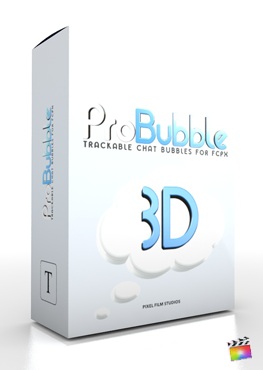 With easy to use on-screen controls and over 30 fully customizable presets users are sure to create their very comical hit with a click of a mouse. With ProComic: Hits users can click, drag, and drop each preset in any location within their timeline. With each preset users have full control over colorization, position, rotation, randomization generators, and much more all within Final Cut Pro X. Users can choose from over 30 effect presets and backdrops all with a click of a mouse all within Final Cut Pro X. With ProComic: Hits users get over 30 fully customizable effect presets ranging from comical hits, backdrops, and even a comic hit with drop zones so that users can create their very own with a click of a mouse. Users have full control over color, stroke, wriggle, spring, multiple randomization generators for each effect, text scale randomization, text position randomization, text rotation randomization, and much more all within Final Cut Pro X. With ProComic: Hits users are given simple on-screen controls to make adjustments over scale, rotation, and position. With ProComic: Hits on-screen controls users can get that perfect angle, position, or scale with a click of a mouse all without the frustration. Creating that perfect comical video has never been so fun and easy to do all within Final Cut Pro X.
ProComic: Hits was professionally designed to work seamlessly inside of Final Cut Pro X. As a FCPX title effect, each ProComic: Hits preset can be dragged and dropped onto the users media and previewed in real time. With the published parameters found in the FCPX inspector, users have the ability to make further adjustments with just a few clicks of a mouse. Where do I find ProComic: Hits? Once the installation is complete, you can find ProComic: Hits in the FCPX Title library.